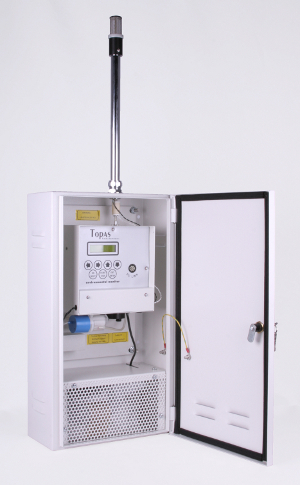 The Topas (Turnkey Optical Particle Analysis System) is a fixed station monitor designed to continuously record environmental TSP, PM10, PM2.5 and PM1 particulates. Topas has achieved UK's MCERTS certification, ensuring its accuracy in recording data. The instrument is housed in a compact, unobtrusive stainless steel wall box with IP66 protection. Inlet heating is fitted as standard. All controls and displays are located behind a lockable door. Several sites can be networked together to form a city wide monitoring system. 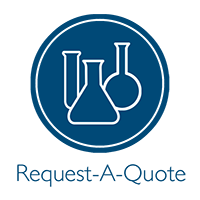 Sites can be connected by radio, telephone, GSM modems, Internet connection or fixed wiring and controlled by one PC using AirQ software. 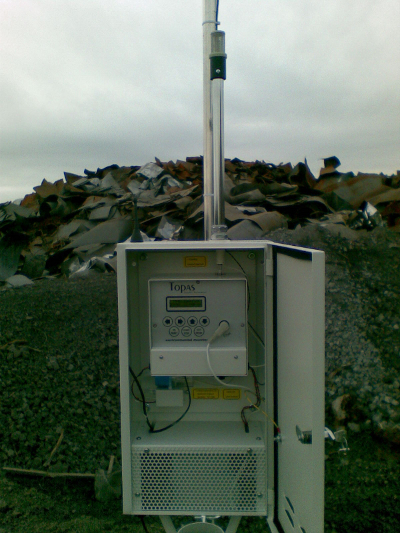 With the Topas comes the AirQ environmental monitoring software providing the user the ability to quickly display results from a range of particulate levels while also including results from optional climatic sensors such as ambient temperature, wind speed/direction, relative humidity. For example, with the AirQ a live "on-screen" pollution rose can readily be created which plots measurements against wind heading on a polar chart. The Topas can be operated on battery (comes with an internal 6v battery), electricity or can be hooked up to a solar panel.